Primrose is a cross-browser, multi-device framework for building productivity tools in WebVR applications. Primrose provides a nice framework for developers to open up in their browser, experiment with new ideas and explore how they look within VR. It is open source, still very new and within active development. A WebGL enabled browser, preferably one with WebVR support such as the latest Chromium WebVR build or Firefox Nightly. An Oculus Rift headset (potentially the HTC Vive too) or Google Cardboard — however, you can experiment and work within the browser without a headset too! A web server of some kind — a local web server like WAMP/MAMP/static Node server/static Python server will do! The ability to touch type — you won’t be able to see your keyboard while in VR! You can try out a completely working version of the live coding over at Primrose’s website (make sure you visit it using a WebGL enabled browser like the ones mentioned above, otherwise you’ll only see a static screenshot). If you would like to have your own copy running locally, you can download/clone the latest version along with its examples from the Primrose GitHub repo. For this article, I’ve put together a simplified version of the live coding demo. It uses the same code as the Primrose demo, just with reduced functionality to keep things simple to explain early on. To follow along with this article, head to this GitHub repo for that version. To run our simplified version of the live coding demo, copy it onto your web server and then open that location in your WebGL enabled browser (e.g. http://localhost/primrose or even just http://localhost if you put it in your server’s root directory. 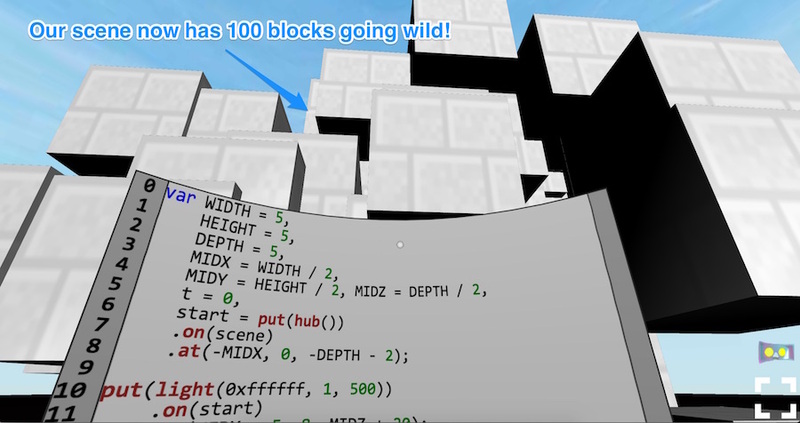 Our scene will change in real time to now have 100 blocks randomly moving about! You can also use the keyboard to walk around the scene too using the arrow keys. Most of the time, you will not need to rebuild much of Primrose’s live code editor example — it is simple to plug in the example code they provide on GitHub and adapt it into your own scene. However, I thought I’d provide a simplified version to explore a few of the concepts of what is going on behind the scenes while showing some of what Primrose is capable of within its framework. Those lines of code define our three texture files and then instantiates our Primrose app inside the app variable. The Primrose.BrowserEnvironment() method sets our scene up with its sky and ground textures. 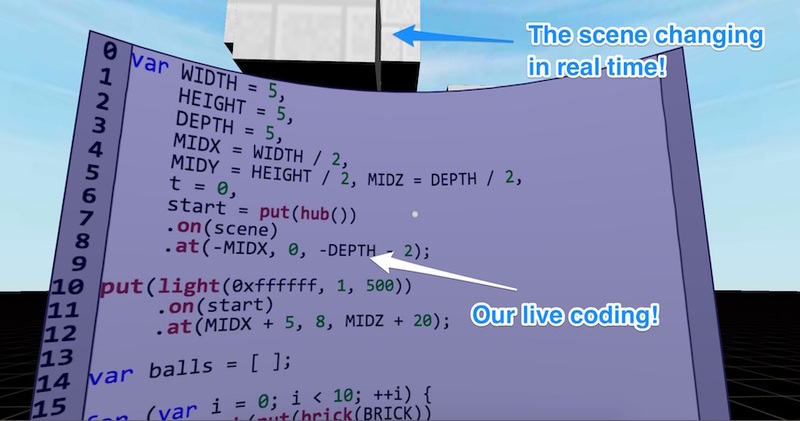 subScene – What we will be able to add and change elements inside of from our live code editor. editor – Our live code editor in our scene (we’ll look at this in a bit more detail below!). 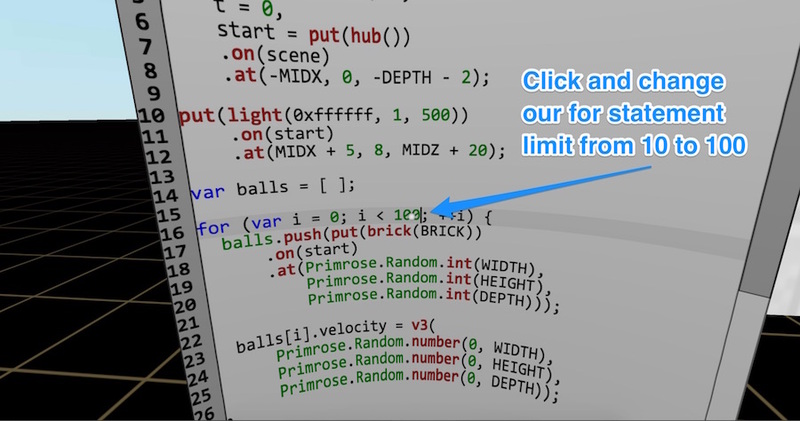 Initial code from getSourceCode() – Within my simplified version, this retrieves the default bit of code that comes with the Primrose editor and gets displayed in our VR text editor. Within the much more complex Primrose editor, it can do a bit more with local storage. Primrose.Text.Controls.TextBox — this sets up a text area and gives a whole range of functionality by default. Primrose.Text.Rectangle — this allows us to define a rectangular boundary for the text area to be placed within. You may have noticed it when we defined our editorFrame too. "update" – This is the only other event we use within the sample editor code, it runs every frame. You use this within Primrose to run animations and check for updates within the scene. "keydown", "keyup" and "keypress" – Runs when a key is pressed down, released, and pressed down and released respectively. "mousedown" and "mouseup" – The same as above but with the mouse. "mousemove" – Detects mouse movements. "wheel" – Detects when the user moves the mouse scroll wheel. "touchstart", "touchend" and "touchmove" – Detects when a finger touches down on an element in the scene using a touchscreen, lifts their finger from the screen and slides their finger across the screen respectively. "unload" – Runs when the app is being closed. My simplified version of the editor does not use this, however the full Primrose editor uses this to save the editor content to local storage. "load" – Runs when the app loads up once again. "pointerstart", "pointerend" and "pointermove" – Responds to both click and touch events on objects, so you don’t need to look out for both individually. "gazestart" – Responds to the very moment a user looks at an object. "gazecomplete" – Responds to when a user looks at an object for the default of one second. "gazecancel" – Responds to when a user looks away before the default of one second elapses. You can change the one second default value via gazeLength but that’s beyond this article’s scope. I won’t paste all of the simplified code within this article (it would get rather long and unwieldy!). You can check it out in the GitHub repo linked above. However, we will go over what a few of the event responses and functions contain. Within our simplified app’s "update" event, it checks for any code changes within the editor, updates them on every scriptUpdateTimeout (a timeout that runs every half second), and runs any animations it already knows about. Inside the response to "keydown" events, it clears that scriptUpdateTimeout timeout, delaying when our app tries to update things! The updateScript() function is run each time the scriptUpdateTimeout finishes. This is what checks if our editor’s script has changed and replaces the running script if it sees an update. 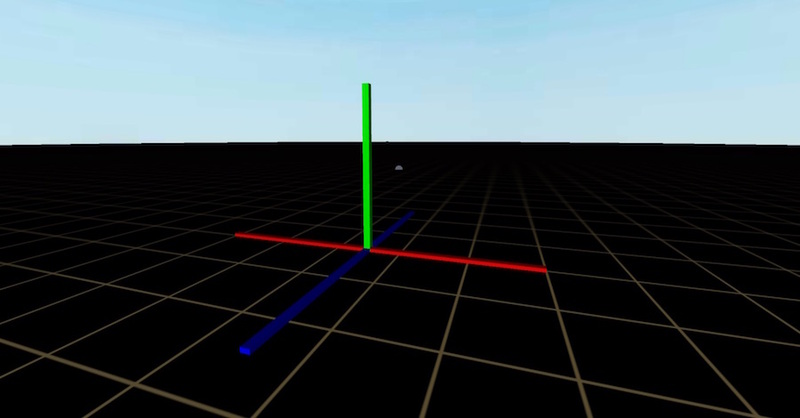 It clears our subScene from above and changes the elements according to our VR editor’s code. We currently have various cubes roaming about and changing in real time when we adjust our code — but what other things can we build in Primrose? 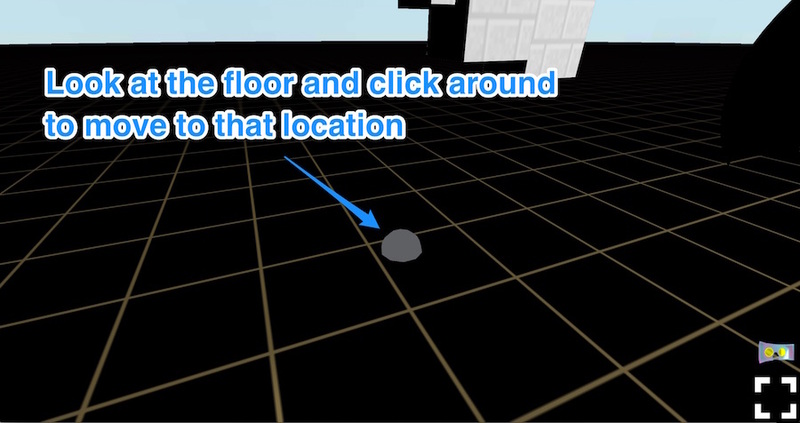 Here are a few elements you can add to either testDemo() in your app.js or into your scene live in VR! MIDX, MIDY and MIDZ are variables already in our sample code that are specifying a focal point for our scene. You could use any numbers in their place. 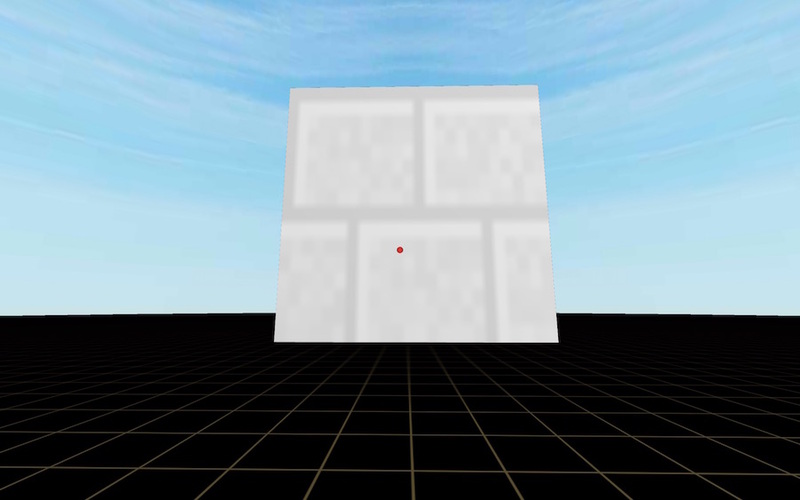 Boxes — and the shapes after this — require texturing before they’ll show up in our scene. They are wrapped in a textured() function that gives them a texture from our image files. The format for a box looks like so: box(width, height, length). There are plenty of other options you can find over at the Primrose docs under “Scripting Functions”, including quad(), shell(), sphere() and more. Explore and experiment! 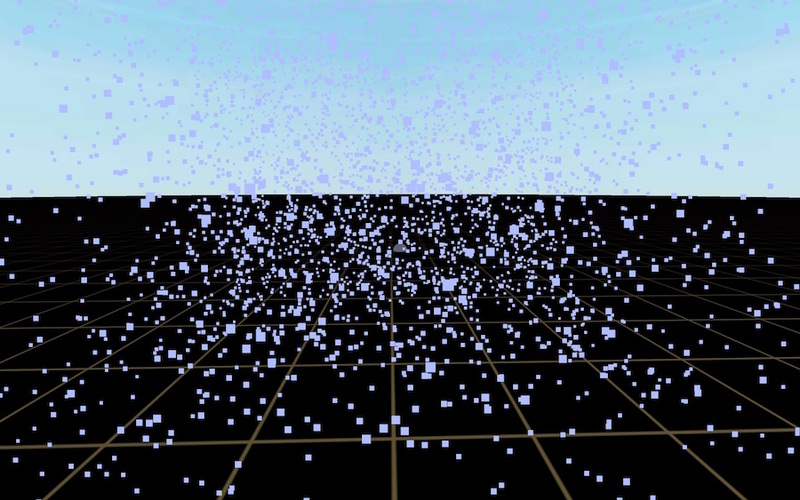 Primrose is an incredibly powerful WebVR framework that will surely power some very useful VR applications in the future. Despite it being early days within both the framework and with WebVR itself, this looks primed to grow and develop with WebVR in a great way as both mature over time. Love the potential here? Keep in mind that it is a project in early stages that you can get involved in too! Get in touch with its creator, Sean McBeth, and get involved! 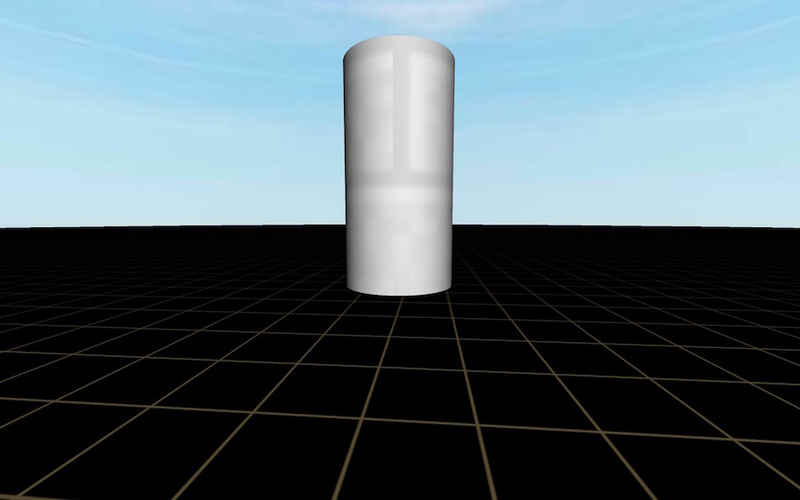 If you use Primrose for your own VR application, I’d love to see what you put together! Let me know in the comments below, or get in touch with me on Twitter at @thatpatrickguy. If you find the area of virtual reality and WebVR fascinating, I spoke to Sean McBeth himself about developing for VR and Primrose over on my Dev Diner website. It is one of my favorite interviews I’ve ever done! Sean is an inspirational guy.